A family business created in 1997, Les Mauvais Garçons is located in the heart of the 11th district of Paris (district Oberkampf / Parmentier). Place exclusively dedicated to men, you will discover tradition and know-how in a simple and relaxed atmosphere. 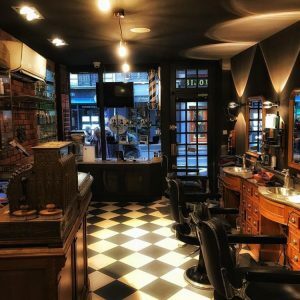 Typical Parisian decor, each object has been designed to give a real soul to the salon.Les barbers offer a multitude of services such as traditional shaving, shaving the skull, beard size, shaping mustaches … but also shaving lessons.Barbers but also Hairdressers, all cuts are personalized and made with scissors with precision. You will discover a sales area of accessories related to the world of shaving and hair. A wide selection of products, selected with high standards, is offered to customers (hair clippers, beard trimmers, nose and ear clippers, exceptional swords, mechanical razors, shaving bowls, shaving care & after shaving, perfumes, toiletry bags, hair brushes, manicure & pedicure sets …).